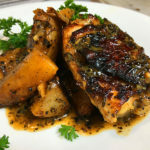 Instant Pot Greek Chicken thighs and potatoes cooked to perfection with an amazing Greek inspired sauce. Tender, moist and bursting with flavor. Combine Greek yogurt, 1 tablespoon chopped garlic, yellow mustard, 1 1/2 tablespoons oregano, 1/2 juiced lemon, 1/2 tablespoon kosher salt, 1/2 tablespoon pepper, 1/4 cup white wine. Mix well and pour over chicken thighs in a glass dish. Cover and marinate overnight in refrigerator. When ready to cook, in a large bowl, mix 1 tablespoon chopped garlic, 1 1/3 tablespoons oregano, 1/2 tablespoon kosher salt, 1 teaspoon pepper, 2 tablespoons of olive oil and potato wedges and toss potatoes until well coated with all ingredients. Set aside. Heat a skillet over medium/high heat. When hot, add chicken thighs, skin side down, and allow to brown for about 3-4 minutes or until golden brown. Do not touch them for 3 minutes, let them sear and check for doneness. Remove chicken from pan to a plate and set aside. Turn off heat and add about 2 tablespoons of white wine to the pan and deglaze with a wooden spoon by scraping clean. Do not discard anything! Pour scrapings and juices into a dish and set aside. Place skillet back on stove over medium/high heat let get hot. Add potatoes and brown for about 3 minutes. Carefully transfer potatoes into Instant Pot. Pour in 1 cup of chicken broth and the dish of scrapings and juice from the chicken searing. Next, place chicken thighs on top of potatoes and squeeze the juice of a half lemon over chicken. Secure lid, sent vent to sealing, and pressure cook (manual) on high for 12 minutes. When cycle has completed, let naturally release for 6 minutes, then quick release the remaining pressure. Remove chicken to a dish and let rest. Use a slotted spoon to remove potatoes. Press cancel on the Instant pot, then press saute to thicken remaining liquid for just a couple of minutes. Generously spoon sauce over chicken and serve. You can indeed use the Instant Pot for the searing/browning of the chicken thighs, but, i’ve found using a cast-iron or heavy skillet for this step to be better because it produces more hear and chicken doesn’t stick. After pressure cooking, the seared skin will no longer be crispy but will retain all the wonderful flavor. If you want to re-crisp, just put then chicken on a pan under the broiler for 5 minutes.